It's all about the Pink!! Carnival Time in New Orleans!!! We have been having an amazing time enjoying the Mardi Gras festivities in New Orleans. We even took part in our first Krewe of Cork Parade. Cork is a krewe for all those who love wine and love drinking it out on the streets of the French Quarter. We heard about it from our friend Patrick who is owns Patrick’s Bar Vin (our second home where we watch all the Saints games). Patrick started the Krewe around 10 years ago and is its perpetual King. The crew now has over 300 members and they all like to have a good time. 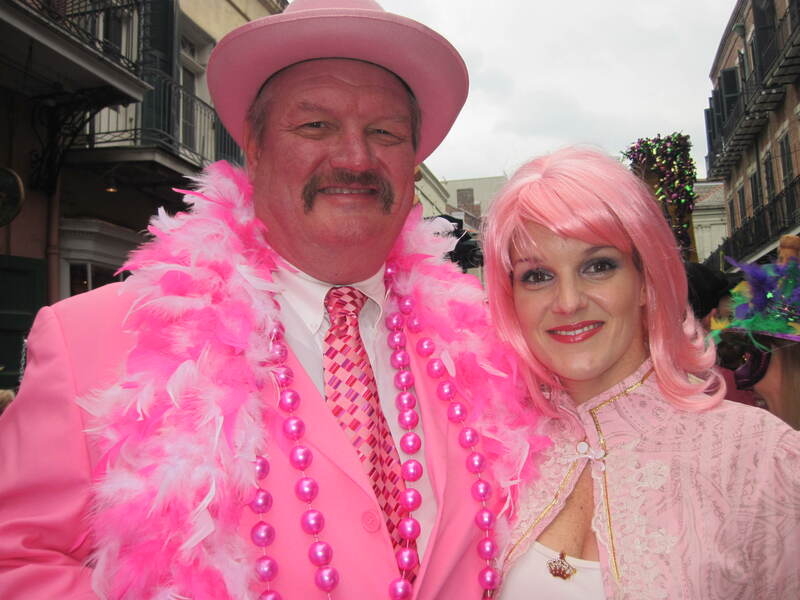 While there are several member events throughout the year, the biggest is the annual costumed Mardi Gras walking parade through the French Quarter. It begins early with a Bloody Mary party on Royal Street, continues on with a rowdy lunch at the Court of Two Sisters, then a walking parade through the streets of the French Quarter with stops at several “refilling stations” and culminates at the Royal Sonesta for a fabulous party with lots of dancing and of course more wine! Our costume theme this year was Pink Champagne. Everyone loved the Pirate’s pink pimp suit! We met so many wonderful people and had a great time. We are absolutely doing it again next year! It’s all about the Pink! !